Hi everyone! It´s a terrible weather here so these photos were taken last weekend. It´s an H&M total look, I just felt in love with these sandals the moment I saw them, and I really like this colorful skirt too. Hope your week begins great! Olá! Está um tempo péssimo por aqui por isso estas fotografias são do fim-de-semana passado. É um look total da H&M, apaixonei-me por estas sandálias no momento em que as vi, e também gostei muito desta saia colorida. Espero que tenham um bom principio de semana! Wonderful! I adore the skirt! love your pretty red top - looks gorgeous on you!! I love this look. Your tee is perfect for a casual and dressy look and your skirt is gorgeous!! Muy bonito todo el outfit! me encanta HYM!! Great look! Love the solid top with the patterned skirt! love your skirt. looks colourful. what a great outfit! I love the skirt! Those sandals are great and so is the skirt! I really like it when the t-shirt is nonschalantly tucked in :). Have a great week, girls :)! I'm loving all the colors in this outfit! The print on your skirt is really nice too! 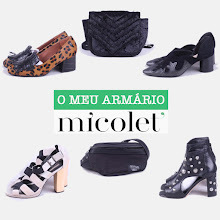 Adoro o visual, ficaste bastante bem com o conjunto :) Uma boa semana para ti! Oh pretty pretty skirt! Loving it. You´re soo much beautiful!! And the cloths are so damn gorgeus!